The idea of the challenge is to stop pinning and start doing, the perfect challenge for me! This is my second one. For the first we did some very simple cress heads, so this time I was a little more ambitious. Between their bedroom and their play room the girls have a decent amount of space to hang up their clothes. But some things just can't be hung and so a set of drawers was in order. 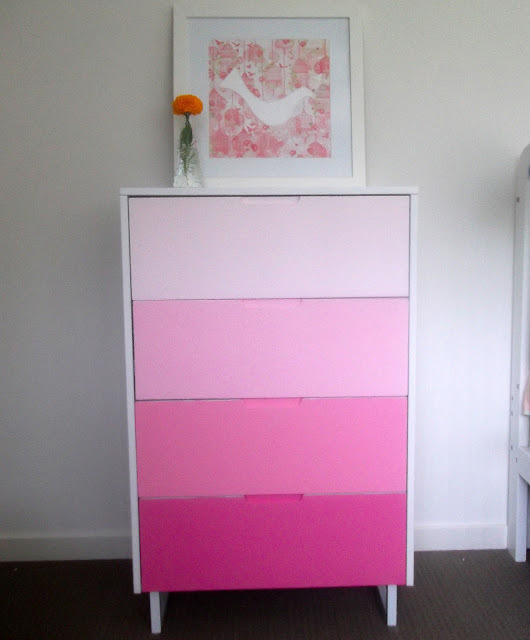 My inspiration pin was this adorable set of ombre drawers originally posted here. I envisioned finding the perfect set of second hand drawers and sprucing it up. Unfortunately it was not to be. Luckily for me, when scouring the Aldi catalogue for bargains one day I came across this set of drawers for $80. Being from Aldi they came in a flatpack and with zero assistance from staff (and some chuckling from an elderly woman standing nearby) I managed to lift these into a trolley and get them home. I'm so proud that I managed to put these together all by myself! 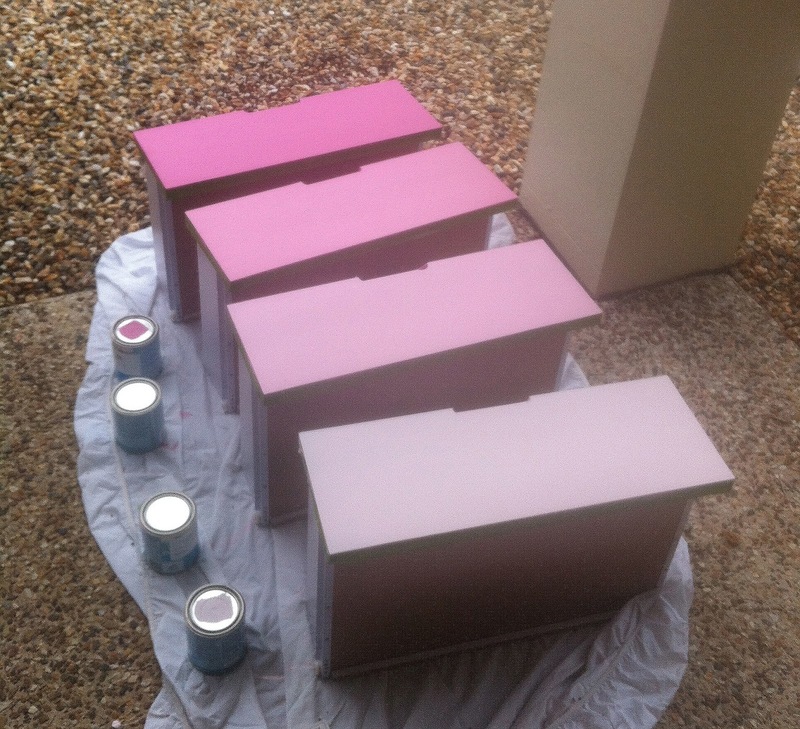 I then did what pinterest suggested and got myself a sample pot of each colour on a paint swatch. The pots were only $5 each and this project barely touched the sides. The girl there was lovely and explained each product that I needed. 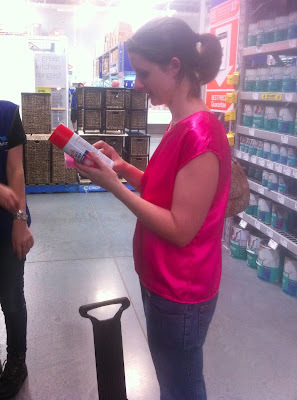 This is me examining the primer that I used. You spray it on, leave it, then wipe off with a cloth. The result, perfectly primed laminate! No sanding required. 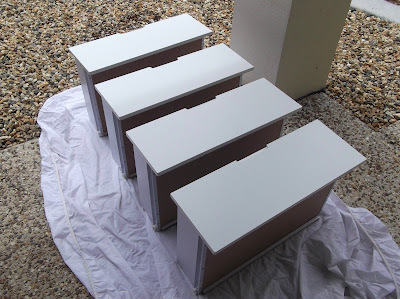 I lay the drawers outside and primed them. I then frog taped around the edges and set to painting. It was an extremely hot day and my paint keep drying too quickly. This meant lots of brush marks. I ended up sanding them back and doing a final coat with a mini roller which seemed to give a nicer finish. The final product, Ombre Drawers. I'm really happy with how they turned out and they tie in perfectly with the rest f the room. I'll be showing off more of their room soon so stay tuned. I'm off now to check out some of the other amazing projects that have been tackled. Hopefully I'll also find some awesome new blogs to follow! Wow - this set of drawers looks great! I've never heard of the awesome laminate primer - do share the details. Thank you and thanks for all your noob painting tips for me too! Great tip about the product for laminate! 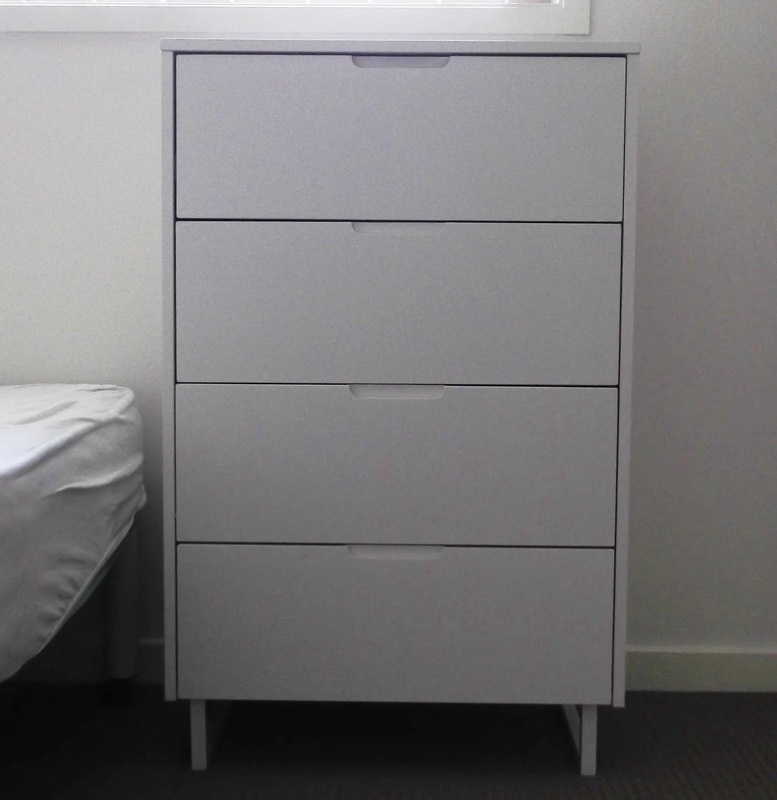 The drawers turned out so beautifully, I love the look with the white. Thank you, it really does brighten up the room! Gorgeous! Love how they turned out! I always see these sort of ombre drawers around Pinterest and have always wanted to give them a go! This turned out gorgeous! I'm sure the girls love it! I'm not sure Em has noticed but Ava thinks they're pretty cool. Thank You! Oooo, very pretty in pink. This looks so good!